Like our clients, we are fiercely proud parents of a petit chou who we enjoy showering with our affection and beautiful, unique products that also make us happy. Each Atelier Choux carré inspires a short story (please see our product pages) with unlimited potential for the imagination. Atelier Choux’s signature, all purpose carrés are our first product, and represent our determination to create an everyday, elegant essential, one that is also perfect for gifting. Our unique organic cotton weave was developed in collaboration with an eco-certified factory in France, in order to create an ultra-soft, breathable and absorbable fabric that also serves as the perfect backdrop to showcase our prints. Our carrés are meant to caress and protect your baby or child, but are also designed as a collectible piece of art, for both of your enjoyment. We plan to introduce limited edition prints, along with carré series that tell a story when placed side by side. Thicker fabrics in the works for winter and bedding is on its way. Each Atelier gift set (with packaging designed as a hotel particuliere, featuring 3 carrés) is accompanied by a collectible art print by our illustrator Mattias Adolfsson. It can be used to decorate your baby’s nursery, a child’s room or even your living room. We hope you will frame it! Atelier Choux plays with grandiose and simple forms, for an aesthetic that appeals to all ages. 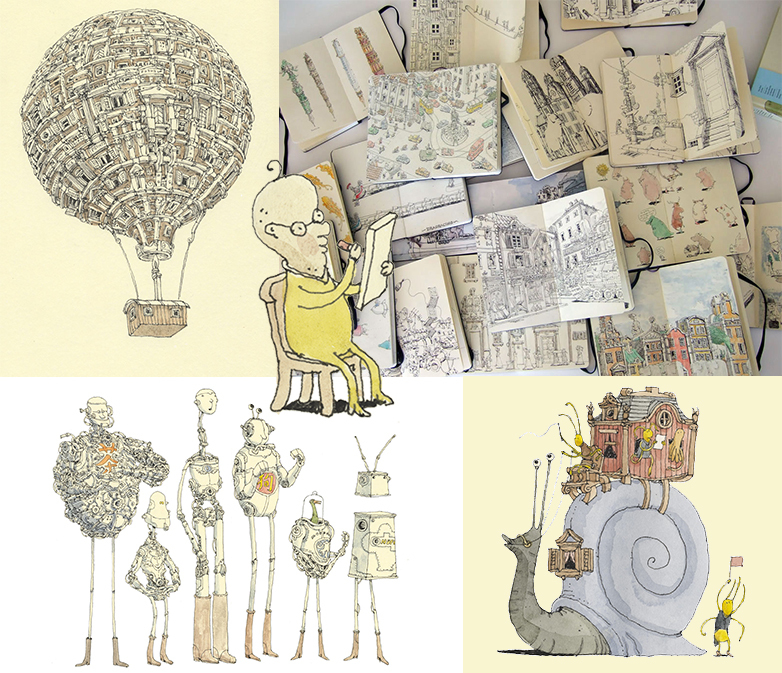 We are privileged to work with acclaimed Swedish illustrator Mattias Adolfsson who is recognized around the world for his whimsical landscapes, with more than 500,000 fans across social networks. From his studio in Sigtuna across from Lake Mälaren that borders Stockholm, Mattias fills the pages of his Moleskine journals with kind robots, gentle animals and elaborate architecture, often in pastels and always with a touch of humor and fantasy. His book, the Second in Line, was awarded the Most beautiful Swedish book of the year in 2014. Mattias has worked with prestigious publications such as the New York Times, Wired and The New Yorker, along with Disney and Nickelodeon. As design and illustration enthusiasts we have been following Mattias’ work for many years. 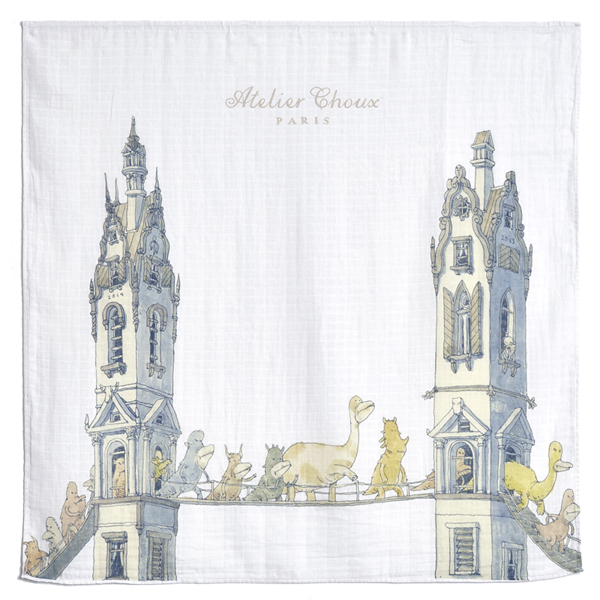 When it came time to decorate our own petite choux’s nursery we dreamed of having Mattias’ prints on luxurious bedding, clothing and more. The Atelier Choux aesthetic was born, with the possibilities of a collaboration rendering us giddy with excitement, with visions of Mattias’ prints from floor to ceiling in our home. Today, our 20 printed carres, our signature packaging, designed in the style of a hôtel particulier, our logo, featuring simple animals and elaborate architecture, and finally our website icons − are all illustrated by Mattias. Click here to visit Mattias’ site and discover his books, collaborations and whimsical aesthetic. We take great care in building our network of manufacturing partners and are as detailed oriented in this regard as we are when it comes to our products. With all production in France, our processes are environmentally and socially conscious and conform to the highest European standards. Our carrés are made in a family owned factory in France, one of the very few that has managed to remain competitive, due to its innovative approach and simultaneous respect for traditional techniques. About 250+ individuals are involved to some level in the production of Atelier Choux products, across fabric engineers, seamstresses and printing experts. 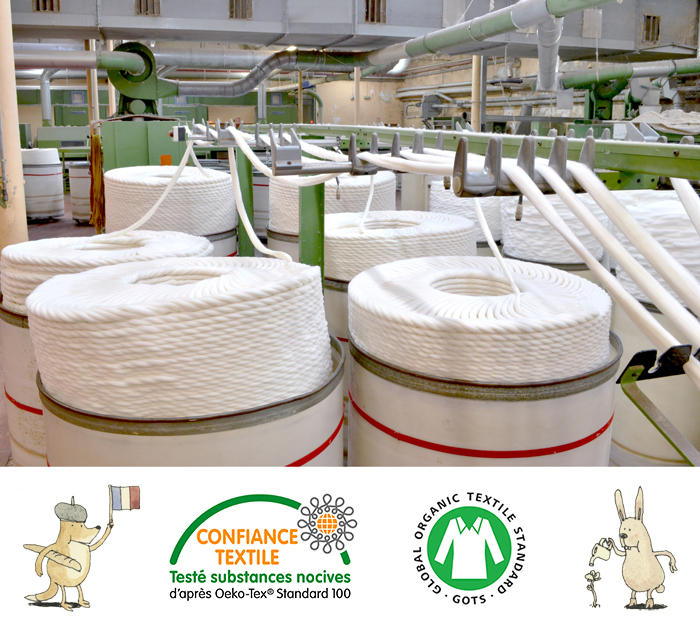 We start with GOTS certified organic cotton in order to ensure a base free from chemical fertilizers or pesticides. Organic cotton fiber is also thicker, feels softer (due to less chemical damage during growth) and hypo-allergenic compared to conventional cotton fibers. Organic cotton also consumes half the level water of water during production. Organic cotton fibers are also bleached with safe peroxide instead of chlorine bleach. Our cotton is safe for those who wear it but also for those who grow it. Our packaging is manufactured in France and is 100% recyclable. A handwritten, personalized note to accompany all gifts, just send us the text with your order. We can also write a small note for you, if you prefer, in English or French. Just let us know the occasion. Worldwide delivery with easy to understand pre-set rates, in accordance with the fastest and most reliable methods currently available. We will continue to study other possibilities to get you Atelier Choux products faster. Responsive, caring customer service, via our contact form. FAQs are also available here. Please do not hesitate to contact us regarding any questions. We are also working on other services like rapid, same day delivery in certain large cities.